Kathleen Matthews, who is running for a seat in the House of Representatives in Maryland and is the wife of MSNBC host Chris Matthews, is drawing heavy support from donors who have contributed to Hillary Clinton. The Daily Caller first reported in February that some of Clinton’s biggest backers are funding Matthews, the former chief communications officer at Marriott International. This has led to accusations that Chris Matthews has a "clear" conflict of interest in covering the Democratic side of the 2016 presidential race. One backer noted by the Daily Caller was Elaine Schuster, a delegate to the United Nations General Assembly who previously served on the board of the Clinton Foundation, and her husband Gerald, the founder and president of the Continental Wingate Company. The Schusters are one of just 12 families that have provided money to all of the Clintons’ elections and causes. Elaine has also given $2,700 to the campaign of Matthews, the maximum amount allowed by law. Elaine’s granddaughter, who currently works as a digital strategist on Clinton’s presidential campaign, also made a donation to the Matthews campaign last November, the Daily Caller reported. Donations to Matthews from individuals who have fueled Clinton’s campaigns and causes run even deeper, a Washington Free Beacon analysis of federal campaign finance records found. Mark Penn, the former pollster for President Bill Clinton and former senior campaign strategist for Hillary Clinton, gave $2,700 to Matthews last year, FEC files show. At the time of Penn’s donation, news broke that he was leaving his position as executive vice president and chief insight officer for Microsoft—which has donated between $1 to $5 million to the Clinton Foundation—to launch his own fund. Penn’s new venture, the Stagwell Group, was backed by a quarter of a billion dollars and would invest in digital marketing services. The Stagwell Group acquired SKDKnickerbocker, a powerful progressive consulting firm, in October of that year. Anita Dunn, the former White House communications director and senior adviser to President Obama’s presidential campaigns, is the managing director of that firm and has donated $2,700 to Matthews’ campaign. The Matthews campaign has paid tens of thousands to SKDKnickerbocker for media production buys. Two transactions from the campaign to the firm were made in July and October of 2015 and totaled more than $36,000, according to documents detailing the campaign’s expenditures. When Clinton was working as secretary of state in September 2009, Schwarzman sought her help to obtain a visa for a person whose name has been redacted from Clinton’s State Department emails. Schwarzman gave $2,700 to Matthews. Another close Clinton associate that has provided funds to Matthews is Alan Fleischmann, the founder and president of Laurel Strategies, a business advisory firm. Fleischmann, who is also a founding member of the Clinton Global Initiative, earmarked a contribution of $2,700 to Matthews’ campaign through ActBlue, an "online clearinghouse for Democratic action" that transmits contributions to candidates and committees. Lobbyist Heather Podesta, founder of Heather Podesta and Partners, is a longtime Clinton friend and has bundled over $375,000 for her presidential campaign this election cycle. Heather’s former brother-in-law, John Podesta, is the current chairman of Hillary’s campaign. Heather also gave Matthews $2,700 through ActBlue. Google Inc.’s executive vice president, Eric Schmidt, gave the maximum $2,700 to Matthews through ActBlue. Google has given between $500,000 and $1,000,000 to the Clinton Foundation. The Catherine B. Reynolds Foundation has given between $50,000 to $100,000 to the Clinton Foundation. Its founder, Catherine Reynolds, gave $2,700 to the Matthews congressional campaign. Xerox CEO Ursula Burns has given the Matthews campaign $2,700 in donations. A Hillary for America press release shows that Burns has endorsed Clinton this cycle. In addition, Xerox Corporation has given anywhere between $10,000 to $25,000 to the Clinton Foundation. Journalist and advocate Megan Beyer also gave $2,700 to Matthews. Beyer is married to Rep. Don Beyer (D., Va.), and both were selected for the Hillary for Virginia Leadership Council last October. Matthews has even received support from actress Barbara Streisand to the tune of $500. Streisand has urged women to get out and vote for Hillary. 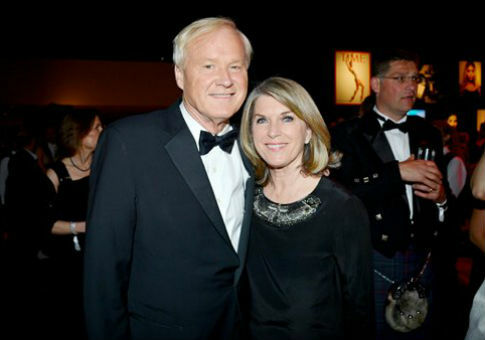 Tim Graham, director of media analysis at the Media Research Center, says Chris Matthews would be better off recusing himself from presidential coverage, citing the precedent of an NPR employee who did the same when her husband was working on Obama’s reelection campaign. "Matthews would be better off to take the year off, like NPR's Michele Norris did when her husband worked for Obama's reelection," Graham said. "I am sure Chris Matthews would insist there is no serious conflict of interest when his wife's donors are Hillary's donors, since his coverage of Hillary this year will be obsequious as the rest of MSNBC," Graham said. "He could also cite MSNBC's incredibly inconsistent ethics on activism—punishing Joe Scarborough and Keith Olbermann for candidate donations, and then allowing Al Sharpton to lead cop-bashing parades which he would then cover at 6 pm." None of the individuals who donated to both Clinton and Matthews responded to requests for comment by press time. Neither MSNBC nor the Matthews’ campaign returned requests for comment. Full disclosure: Joe Schoffstall is a former employee of the Media Research Center. This entry was posted in Politics and tagged Chris Matthews, Hillary Clinton, MSNBC. Bookmark the permalink.